When people are ostracized from family, it is because the family did not like their choices. | ConductDisorders - A soft place to land for battle weary parents. When people are ostracized from family, it is because the family did not like their choices. Discussion in 'The Watercooler' started by SomewhereOutThere, Apr 29, 2015. I think groups are amazing when people are suffering. We get to hear, in a private way, how others feel about the same issues we are going through. Heck, I was shocked that six other women understood my situation with my mother and siblings and them not buying my view of reality. They all, every one, agreed that their siblings, who were not abused, did not lived the same type of abuse that they did. Many were no contact with their siblings and mothers on purpose. Stupid me. I kept trying to make them LIKE me, but that was at a time when going no contact with your own mother labeled you a horrific person. Three of the women were my age. WE spoke about life long triggers and how to deal with them. Was very helpful not to feel alone. WE also discussed how we are usually tossed out of the family for making choices the family didn't like, whether it was speaking out about family secrets, living life in a way t hey thought was wrong, deciding not to divide $5000 of inheritance from grandma to only and that often one child becomes the scapegoat. My facilitatior made me laugh when she asked, "You sure your mother wasn't borderline?" No, I don't know or care. We covered a lot in an hour and a half.I heard many stories, some worse than mine, some just like mine. I left the meeting feeling validated and understood, which is what we all need. I also left with Mother's voices of "you're stupid" "you're lazy" "you're no good" "you never do anything right" out of my head. And I actually laughed when I told the group how my sister wrote that I had NPT/Borderline (BPD). Ok I have been told by my therapist I may have "a few" (her words) Borderline (BPD) traits that I control well, but NPD???? That isn't me at all. I'm the last person who wants to be the center of attention, I don't give a f**** how I look, and the world revolves around everyone else EXCEPT me. If anything I am codependent. So, she can say and think what se likes. I don't care now. Brother? Who cares what his issues are. I also got to learn that most people in the group do not have good made families, like me. The faciliator has a great boyfriend and young son. I have a great husband and great kids. Everyone else is still struggling with being alone. Thank God my FOO did not do that to me. They would have liked it, but it didn't happen. The other two are alone. I'm going back every week so I don't forget to think about those who deserve my time and to remember I am blessed. Those of you wondering if you should go to groups, like Al-Anon or Abuse Groups, if you are ok with listneing (you are not forced to share) you may just learn that you are not alone and you may walk out of there feeling much better. I have participated in FOO group therapy. It was life-affirming in a way I cannot describe. While I could empathize with the abused child in the remembered abuses the other women brought up though, I was not able to empathize or believe in the little girl that was me. Now, thanks to all of us here on the site, I do believe in...a kind of generosity of spirit a kind of openness and honor, that I can claim. It feels like some kind of miracle, to have broken through all that. Here is poetry from FOO group therapy. in their sun scented hair. Wow. That is great! Did you write it? It can happen in big splits too, if the family is large. One woman has six siblings. She and the older three were treated like trash in every way. The younger three were not abused. They can not talk about their mother or they start to fight. In their family they made a decision to not discuss the topic. I wish I could have done this, but since it was just me and two others who did get the horrible verbal crapola "you're bad" "you're bad" "you're bad"...I wanted my siblings to believe me and they don't and now I know that they won't. And that I'm not the only one who has this. Two women in the group won't even call their mother a mother. One refers to her by her first name. The other just says that she refers to her as "Her" and "She." It just made me feel not so alone. Even here I don't think most people had our experiences, Cedar. One thing we all had in common is that we were the one who dared to fight back. Not physically. We just called a spade a spade. And these control freak mothers (and fathers too) need to be in control. And in my case, my mother was angry that HER mother would take care of me, no matter what. It was in that FOO group that one of the women told about being broken and rebroken over the shame of a picture her abuser had taken of her after an abusive incident. She was still hating herself for having been that person, and she lived in horror that somehow, some way, that picture of her as a hurt and hated little girl would surface and destroy her. That is an extreme case, because of the proof, because of the picture. She could not move on from that place of self hatred and rage. Eventually, because she had all of us in the group to witness for her, she did begin to confront the terrible pain of the way she'd been taught to see herself. That is the victory, for us. To cherish ourselves, as we should always have been free to cherish and trust and befriend ourselves. Just as the abusive incidents were impersonal, so is the healing an impersonal thing. We reclaim our own power and then, realize it was ours for the taking all along. I wonder what to do about the rage I feel at having been thwarted, at having been in the impossible position of "I believe" or "I have been a fool for lesser things". But that is okay. Maybe I would do it all again and probably I would. One of the other ladies in group urinated on her (sexual) abuser's grave. He had been a minister. No one believed, when she told, and the shame of it dominated her life. I don't know what happened to these women. I do know that it was willful destruction of the secrecy surrounding the shame of the hurt that allowed reinterpretation of self. And certainly, that is true. "Thankful for the illumination, however dim, Pitt continued to climb." That is from Clive Cussler. I don't know which book. But I do know Dirk and his,trusted cohorts engage in adventure after impossible adventure for the thrill of the win. That must be why we enjoy sequels. Life is like that, too. I did write that, SWOT. That is how it felt to me to spend that time in group.therapy. I wonder what happened to everyone. Im glad the support groups are helpful to you both. I do understand how it would be a difference being in the physical sense with others compared to online. But am still extremely relieved, loved, helped, understood, and supported here. One day I might go in person I don't know. But thank you for sharing and this why I have felt some relief just with being here. Keep making all yourselves happier, life is too short! Beautiful writings by the way! So true! Confused, I think healing is easier, here. We are anonymous. There is no trust/betrayal issue. We don't really know one another ~ except that we know one another intimately and support one another entirely and if one of us falls short, there are others to pick up for her and so, we are all healing into joy and wholeness. In group...it was such a raw, vulnerable feeling to discuss secret, shaming things we could barely stand to face, ourselves. Telling those true things about our pasts, about who we had been taught we were, was so hard. The site is like whispering secrets into a well and listening to a thousand sources of wisdom whispering back. We can take a break from it when we need to, and everyone will be here when we come back, and so happy to see us and to wish us well. I am proud of all of us. We display such courage in the questions we ask, in the raw honesty of it. Though we so often describe or envision ourselves as weak or confused or as failures, we are actually such strong women I can hardly fathom it. We are recovering our capacities for joy, here on the site. We are using it ~ that capacity for joy and for loving and expansive new breaths ~ we are using those things for our guidelines now, and that is changing everything. That is the extraordinary thing that we do here. Rediscover our capacity for joy. We were already so much stronger than we knew. I never admitted so much that was inside of me in either therapy or to a group...not like I do here. I didn't even realize how much was still fooling myself and lied to myself and told myself that it was ok for my mother to abuse me and disown me. I tried not thinking of it as scapegoating or abuse. I let myself take the blame because my family said I abused her and she didn't abuse me. I blocked out how callous everyone was to my very real mood disorder, panic attacks and learning differences. I refused to think about how my siblings said nothing in my defense while, at the same time, using my company, advice and,yes, compassion when they felt entitled. I let so much from so far back that never changed sit there and then I'd explode. But I'd pack it away again when sis came back. I'd try again. How I wish she had permanently cut me off the first time she did it. I lived fine without her each time she was gone. It all came out to me when I started debt therapy I saw and admitted things to myself. I can't go back to pretending. I owe many true memories to my posts here. Thank u for making me realize the truth. It is kind of sad but also a huge relief. Stop telling secrets to yourself and don't lie to yourself. That causes a false life. top telling secrets to yourself and don't lie to yourself. That causes a false life. Agreed, SWOT. But you said it, it takes courage and community to go there. Reading this thread brought me to look for this. And there it was. I just had to ask the question in the right way. Thank u for making me realize the truth. It is kind of sad but also a huge relief. Stop telling secrets to yourself and don't lie to yourself. That causes a false life. "Stop telling secrets to yourself...."
That's perfect, SWOT. That is how to clear the shame that keeps us hooked into FOO issues. Where we feel shame or disbelief regarding our families of origin, that is where we go to work; that is where the root of the trauma is. I have been thinking about this through the weekend. About family, I mean. Whether Family of Origin or the family D H and I created, I have been thinking about family, and about relationship, and about enabling. You posted on another thread SWOT that you would not go no contact with your sister or brother. Essentially, that is what I have done. With them, and with my mom, too. But I don't exactly see it like I did that. The game has become so obviously mean and purposely hurtful, since my mom and my sister have been together in the winter months. But when my mom was with me for only one month in the winter, she hurt my D H. I was still only able to see "That is just my mom. That's how she is." But looking back...well, that's the thing. I can't see the wrongnesses as wrong, so I am at a disadvantage where my mom is concerned. Have I posted this? I think not. So I will now. One time, I was at my mother's with my granddaughters. And my mom drew her arm back and pretended she was going to hit me. Like it was a joke. And we both thought that was really funny, except for me. I wonder whether I am wrong in that ~ in turning away from that whole mess this family of origin thing has become since my mom has been spending those winter months with my sister. And then, I remember particular things that happened. I am seeing from a different perspective now. I vacillate between believing I should contact at my mother, and knowing full well that I am not real to her. It is a strange little dance, the one between justification and the redemption that lives in what it looks like. That it would look like (to me) I had done or am doing, the right thing. So the question becomes, what is the right thing? What is the nature of the right thing? As it is with my kids, the right thing has to be outcome based. Whether I am codependent or enabling or any of those bad things, I had the courage to step away when I believed that was the thing that would work. I don't hold...I don't know what I a trying to accomplish. Maybe, nothing. But that doesn't feel right, either. I mean, don't we have to try? I do not ever see myself disconnecting emotionally from my children. I don't want to. Where we go in the Winter, there are three houses. One is the mother's, one is one son's, and one is another son's. When that family goes North, they go to a neighborhood there where they have...three houses. There is a daughter there, too. Perhaps then they have four houses. And they are all such nice people, and that is what I wish I had, too. So, I am just going to tuck that little piece of comfort away somewhere next to my heart, and one day, you never do know. On the other hand, wait a minute. None of that mother's kids are...er, you know. Differently wired! That's it. None of that mother's children are differently wired. So maybe I should count my lucky stars and make a wish for healing and relish the blessing of life as it is. Back to my rotten FOO. I would see them intermittently until I could not function through the sick of it or until I was vulnerable, until I had already been brought low and distracted, and they could hurt me. And they invariably do. And those like them invariably do. And when we see the patterns in our lives, the abusers we seem to draw, the way we refuse to believe that it is what it looks like, we do feel like dreamers, or like romantics (that is how my mother describes me). Like someone who just doesn't think right. Like I can't see the forest for the trees...which might be true, darn it. But I just know we can change, any of us, all of us. We are all looking for a way to do this, to live our lives and create societies and face our mortalities the best, kindest way we know or there would not be art. So anyway, there we are in our lives, trying to make it work. I love that I did that. I love myself for having done that, for having tried. And yes, it fell right into enabling and that is an ugly, twisted version of love. So I've decided to love my kids and hate my FOO. On we go: We just can't make sense of life as it seems to be from the perspective of our abusive parent. It doesn't make sense to us that this is how things should work. It feels like we must be missing something crucially important. Until we figure it out. Abuse works because it doesn't make sense. We are the normal ones. That is why, in an abusive situation, we cannot make any sense of what happens. So...when we feel trauma now, in our adult lives. That is an echo of the original trauma. When we are with someone who does something bad that surprises us, something we had no clue was coming and yet, pretty much always knew was coming: It is okay to explore, there. Like in Dr. Seuss: We can go any direction we choose. We will call and recall mini-trauma that echoes the major traumatic themes in our lives, to heal ourselves. That is the meaning of courage. (Thinking of Copa and the lunch lady who surprised her.) The thing that happens with us is we feel we need to protect ourselves when the truth is we called this as surely as the other person did, and we both needed whatever the experience was. That is why it is wrong to turn away from friends or family, maybe. Because then there are no further lessons. So, when we declare an ending, we are saying we need time to assimilate and heal from the trauma recalled thus far. Well for heaven's sake. I am chatty this morning. I should take a site break more often. The danger, for us, is that we may slip into trying to bring everything into balance. Our job is simply to observe our feelings and heal the initial trauma through exploring trust and betrayal and figuring out how to cherish ourselves and one another through it. I am sure this is true, but I don't have a clue how to do it. I would rather hate my FOO for right now, and have a temper tantrum for a little while. Adulthood is so over-rated. I am tired of being an adult, just for today. The thing is that when we are trying to do our exploring of relationship to see what is real, we can't believe our FOO is actually lying to us about who and how we are on purpose, to twist the power thing in their own direction. The only thing we can conclude then, if we are honest, is that they must be correct. So it would be a majority rules thing. We call echoes of the original trauma into our lives to heal it. Not in a mystical way. We just can't believe what happens, so we keep going back to be sure that's what happened. When we are still so new to our healing, to our looking and seeing what is for what it is, our natural tendency is to believe they meant whatever they said or did personally, to us. They didn't. To the degree that each of us is unhealed, we will stop. We see things that aren't there and begin to justify our own interpretations. For us, that would mean that though we aren't seeing what the other guy is, we must be wrong. In fact, we are very right. Confusion is where we get to choose a different interpretation of self and other. But what we feel, in these traumatic re-enactments we call and cannot turn away from, are the same feelings that created the trauma in the first place. If those lessons were beat into us, so much the worse for us as we try to determine what is real and whether that matters. And that is what we need to see. That the abusers interpretation was a universally wrong thing, whoever its victim was this time. So when these things happen in our adult lives that we cannot understand, we believe the other guy must have a valid point because we were usually the wrong ones when we were little and in abusive relationships with our own parents. When these things happen to us as adults, we believe, just as we did when we were little, that we must have gotten it wrong. We believe it was our thinking problem again ~ that somehow, we did not see what we saw and we never heard what we heard. Something wrong with our perceptors. That is what happened with that first therapist, too. What could it mean, to betray the trust of someone who is paying you to stand up for them until they are strong enough, until they can believe in themselves enough, to stand on their own? And what could it possibly mean to accuse a patient of being a manipulator when that is what I am there to do? Manipulate him into believing ~ whatever it was I was trying to do. As it is with every instance of abuse...nothing personal. The miracle is that we tried, and that we keep trying. So maybe that is how we need to see the messes in our families, too. Or with our friends, as Copa is doing with the lunch lady, who may be so much like a less-evolved version of who Copa was herself, once. We are figuring out the truth of things. And that, for us, turns out to be an ever-changing thing. If I am going to continue to use that word so much, I am going to have to check the spelling. That is why there is so much kaliedescopic imagery for me then, maybe. Anyway, the danger for us, or the challenge, depending on how you see it, is that, until we are healed, it will be our tendency to believe that what they (FOO) taught us about ourselves must be true. I don't know why I find it so hard to believe they lied to me on purpose, given all the other things they have done. I mean, you don't accidentally hit and kick and beat your own children routinely without suspecting that makes you a jerk. We work so hard at trying to figure out the why of it. Then, one fine day, we figure out that it was the initial belief system that was the lie ~ all of it. That is what abusers do. I have to keep saying that, because otherwise I will not believe myself about how this could actually be what it looks like. It makes no sense to me. Just like it is with everything else in our lives, when we know better, we do better. That is the only thing I know for sure. We all are doing the best we know. Except for people who are like, jerks. And certainly, for me, that vulnerability, that thing that might have made my FOO right about me after all, was losing my own family. For another of us, it might be divorce. Or any of ten thousand other vulnerabilities we have been coached to believe are the only things that matter about us ~ or that we have taught ourselves could matter, could make a difference, could save us. That is why hearing the things every one of our difficult child kids says to each of us here on the site, almost verbatim, however they were raised, keeps coming back to me. How could these words that hit the heart of me be true, be particular to me, if your children are saying the same things? Because we were set up for it by our original abusers, any challenge we face will echo the trauma of those same, first lies we believed were true about us. Here is me, with my babies. Either baby. That is all of us, with our babies. What an incredible thing. And how awful to know that our baby is not safe, and that helping them is not going to help them, that the trouble this time is not something we can fix. It isn't that we are wrong in trying to help. It is that this trouble is too big for us to fix. But what we do not see is that we were not the ones who did not keep our children safe. Against our advice and against our will and even, against their own wills, there is addiction. Or there is a proclivity toward emotional illness and that is exacerbated by addiction. I was stronger, when it first started happening. But I listened, when "they" said I had parented this into existence. I was the mom. There was a time when homosexuality was blamed on the relationship to the mother, too. We believed things like that, things come of a pervasive societal mysogyny we still don't want to acknowledge ~ we believed that, back then. But what I really know is that I was a screwed up but good enough mom. I did not do what was done to me. I could not give what I had not been given, but I could, and I did, learn all I could about how to do that. I had D H mom. I was a good enough mom. I am a good enough person. They lie. The lies are interchangeable, and they will use whatever works. No integrity. And of course they are happy with the results, because that was their sole objective from the beginning. So I don't even get to be: "I told you so." That is where the hurt is for you I think, SWOT. Here it turned out never to have been true, and they don't want to hear it! It's like this earth-shattering thing, and they don't want to know the truth of it. Because they want what they have done with all their hearts. Their blackened, shriveled little tiny hearts. Maybe they are afraid they will lose what little they have. And in the Bible, it says that they will ~ that we all will, lose whatever we have, if what we have is not enough and if we do not have courage. That sounds like a cop out, I know, but it isn't. It seemed pretty clear at the time. I didn't want to duplicate with my own children what had been created in my FOO. I would not believe people would choose to relive the toxicity ~ I mean, to re-enact the whole, ugly thing. But they were doing it all along because that is what they picked the first time around, too. It never was that they didn't know any better, or had not had the same benefit I have had to see how to do this, how to live a life and be a family, in a better, more rewarding and strengthening way. But just like that Tom Petty song about not having to live like a refugee, we can choose something different. We can choose to see. Everyone always thinks they are awake, that they see more than me. Remember what the Buddha said about that? "I am awake. ", some seeker said. "So you believe. ", was the Buddha's response. So, we just have to keep trying. Maybe the key is to address the feelings of shame or trauma and let the namings or accusations just sit there. But you are right about not telling ourselves lies, SWOT. What we need to do is dig into and confront what we are ashamed of because we secretly believe the lies we grew up with. And it is that set of beliefs that keeps us a mess, that keeps us trying to make sense of things, to this day. It is beginning to come clear for me. (Oh oh. I am awake. So you believe.) I imagine that we could not see the dysfunction until we were healthy enough, when we go back in our rememberings, to name the dysfunction as dysfunction. Though we all say: "Oh, that is just how so and so is." That isn't true. So and so chooses toxic for his or her reality so he or she can come out on top in a game that looks, to us, like a kaliedescope. (See? I should have looked that word up. Then, I would know.) Instead, I have to not be perfect one. more. time. Instead of trying to be better than whatever that bad thing that happened was, instead of continuing to interact with those determined to keep us where we were or who have an impersonal vendetta of punishment and revenge to mete out, we really do have to distance ourselves from them. From our perspective of "We can do better." But I think that, just like it is with enabling or with any self destructive thing we somehow stumble into, even that choice to be kind that later turned into something that may have been cowardice and functioning behind something that somehow became a persona ~ I don't think it started out that way. I think the persona hardens with continued abuse over time. Maybe that is where "What kind of person...." questions come in. That could be the persona, the person I wish I were, having a look at situations in which I should have just given up and gone home. Except that it was my heart that had been hurt, and I carry that with me, of course. I acknowledge the shame in how messed up everything was and is. It just isn't my shame, any more. People do the damndest things. We are so forever blind regarding our own motivations. That is why we need to tell ourselves the truth, to find out what lives beneath the shame and clear it. Like a kalidescope, the patterns never holding still. But maybe we are the lucky ones, who can grow through it. And maybe, when we think we are done is when we have hit that brick wall and begin to wrap ourselves up and refuse to see further. We come out of it, after awhile. And it takes the tie it takes, and that is a fine thing. I can remember listening for hours to my mother spew poison about my dead grandmother when I came home to be with her after my father's death. That is what she chose to do with my time, and her own. And I had come from more than a thousand miles away to be with her. And I left the house we were building with just the contractor to choose for me, and that was okay but the house would have been different, had we been there to see and decide. I can remember believing that if I could listen sympathetically long enough, the bitterness would be cleansed and she would be able to heal. As of the last time I saw her and from what my sister said the last time I talked to her, my mother is still vehemently hate filled regarding anything to do with my grandmother. This is the grandmother I am forever talking about, the one who made the difference in all of our lives. And my sister was vehemently hateful about the man who wanted to marry my mother, and take her away, after my father died. Abusive people don't change? What am I doing here all the time, posting my face off at my age, if not for change. Here is another thing I posted yesterday and decided was too yucky to post. I don't want you guys to know everything about me. I would like to be seen as this really together person and so on. Looks like I will have to pretend to be that somewhere else!!! Anyway: There is a part of me who believes I do not have the capacity to think right. I don't think like everyone else. I never was able to do that. My mother: "Just don't think, Cedar." She said that alot. It was part of the abuse thing, part of the breaking of my spirit, I suppose. My father would just say things like: "I've never seen a kid like you." So, I don't know what is beneath that, but I brought it up here, and I can remember bringing it up in FOO group therapy, too. It could be that those are good differences. Or it could be that kaliedoscope thing. I feel a strong need to interrupt my reading of your great post and address this right now. IT IS NOT TRUE. It is hogwash and you know it. It is them needing to think we are "bad." Do they even really know us? They address a few incidents that they didn't approve of, but do they know the good we do, the love we have (yes, even for them before t he final tumble), the truth we are not afraid to look straight in the eyes? They are wrong and you don't need to be 100% healed to see the foolishness that even the most academically successful abuser (who may not even know he is an abuser but bartely knows us) is spewing out of his mouth. Or hers. They weren't there. They were never there. NOBODY, especially your FOO, is right about who you are. I know for a fact that if my dad, who has been so open and kind to me lately, did not have mney, my sister would have cut him out of her life. She has made it clear she NEEDS his moneys. She has talked about it to me. She wants it so she will tolerate him. But she doesn't like him. She is poor now and to her only his money can save her since her quest to find love did not pan out. She really believes HE caused all the problems between E. (my mother's new name to me) and himself. E. was a tyrant and if I were him, maybe I would have handled things better, but I would have been out of the house as much as possible too. That is one of their gripes. I would also haver spoken back to the horrible things she said about his family. I DON'T BLAME HIM. He even cheated once. I suspect my mother was not letting him touch her and her only comment about it was "I wouldn't even have cared if he hadn't picked such a low class welfare woman." SHE DID NOT LOVE HIM! And my grandmother, who was so kind to me, egged her on to get her divorce. They can deny it. They sat for hours listening to E's tales of woe, but they disregarded my father's side, just as they do me. They don't hear two sides and my mother was persuasive to two adults who wanted to believe in her. She was, gosh darnit, always The Truth. That is typical of one who scapegoats. The exalt one and bash the other. It is also a trait of Borderline (BPD), but we aren't going to talk about Borderline (BPD). Do NOT believe what a scapegoat tells you. I am past you in healing. I am really doing pretty well. But I want to help you over THIS bump right away. They are full of baloney and share the same sandwich. Who cares? I would never go no contact with anybody who needed and wanted me in their life. Lo contact yes, but not no contact. It is a form of abuse and obviously by the way my sister kept and maybe keeps reading my posts, it does not help the person who does it to let go of the person they allegedly have no contact with. There was obviously big interest in me from her, even after her no contact. That says TONS. She will never be free of me even if she never sees me again, which is what I hope. We are never free of our FOO completely, even if we don't see them. I'm not made that way...going no contact as a decision. I think it's cruel. But I will have no trouble STAYING no contact with them, since THEY made the choice and NOT coming back, even if they become very sick or remorseful. I'm done. And I don't feel guilty about it because I tried. And God, whoever God is to you,...he/she knows just how hard I did try and how much I took as I tried. I have a clear conscience. My family is my made family and my father who was scapegoated as badly as me. Nope. For me it was that they honestly don't believe it happened. They think it was fiction. They can eat my shorts. I am so done with these two strangers. 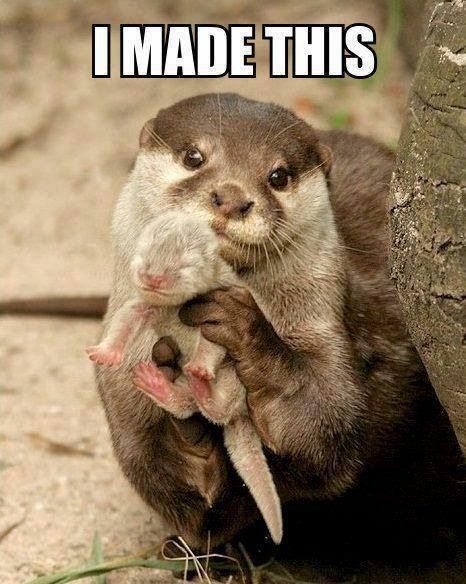 That otter holding her baby did not come up correctly. Too late to edit, now. Let's try this one. There I am, showing the world (my mom) my new baby. Manipulate him into believing that what they taught me about myself wasn't true. That therapist did an abuse on me. (Actually, he was a holistic physician, not a bona fide therapist.) A therapist I talked to about it much later told me that. That this happened because the first therapist was not adequately trained to have taken me on. I didn't believe him because 1) he was a male and 2) I still had that therapy thing going where you think the therapist is all-knowing and all-seeing and eternally correct in his assessment. That is why a good therapist can stand up to your abuser for you. You believe him more than the abuser. That was a very bad thing to have happened to me. Especially since I was so focused on finding out whether I had done something to my daughter to cause whatever happened to her. And I didn't know what that was, either. But here I am, healing from those interpretations, now. Still, he shouldn't have done that. He was supposed to be careful enough of me to have recommended that I see someone else, if he found himself being successfully manipulated by me. Still, it came right out of left field, when he said that. But, then I searched for and found an excellent woman therapist, and the FOO group therapy. But I have been a really long time coming back from that first therapist. Yay for me, that I have all of you. You helped me too...sooooooooooo much. I never realized how much just writing can help. I had memories writing here that I had forgotten about. One is a very disturbing one of myself in our old, old apartment and in my bedroom and I can't be older than three and crying while my uncle, who must have been very very young at the time, is there telling me things that are scaring me. Is that all he did? Probably. I can't see him as a predator. And I have no memory of that. But he did something while we were alone and it was darkish in that room that made me cry. It's amazing what we repress. People who don't remember their early childhoods don't believe how much an abused child can retain from very early on. I have been reading extensively about scapegoated children. I do not have a lot of clear childhood memories, but I have more than the average kid. Flashbacks mostly. But I do remember every teacher I had up until eighth grade: Mrs. Carlson, Mrs. Goodman, Mrs. Bear, Mrs. Boehning, Miss Naslund, Mrs. Clifford (shudder...she used to manhandle me and humiliate me back in the day when this was allowed), Mr. Olsen (big crush on this Norweigen hunk who had his accent still, Mrs. Knoblech and Mr. Ryan who ignored the bullies (eighth grade was my worst year to be bullied) and let them harass me right in front of him. That's pretty good!!! Right? Guys, I just posted on the Enabling thread. I think it pertains more to this one. Check in with me there if you would. Thank you. did not have mney, my sister would have cut him out of her life. Money, having what is left (all of it, from the look of things these days) plays a big part in whatever it is my sister is healing in the things she does. She has wanted my parents' house (which is on a lake) for a long time. She would come up with all kinds of ideas about how she would come and live there with them and take care of them and then, take over the house when they were...when they were, you know. My father kept this sister in her place. Does that mean, and I think about this too just lately, that I should be protecting my mother? But I have spoken up. Especially where the man who wanted to marry my mother is concerned, I told my mom he was an ethical man, that she would be safe with him, that she could explore all kinds of wonderful things (they were going to travel, and to live in another state altogether, and etc). And my mother chose to do what she is doing. The man has not given up, apparently. The first call I had from my sister, after so long a time, was: "We've been duped." She (my sister) felt such betrayal that my mother had seen the man again, last summer, when she (my mother and my sister) and I were not talking. It was surprising to me, at the time of that phone call, to know my sister would assume I would feel "duped", too. But my mother would have been happily in her life, with that man. He had a large, loving family. My sister hated that about him. She hated that my mother would come to know his family and think the worse of us for it. It seems so sad. I don't know what else I could do about any of it. My brother continues to care for my mother during the summers, when she is here. He does not hear from her (at all ~ not so much as a Christmas card or a phone call or an email) during the months she is with my sister. When I made the decision not to see my mother last summer, my brother was very upset with me. I told him he would always have access to me. So far, he hasn't taken my up on that one. She really believes HE caused all the problems between E. (my mother's new name to me) and himself. We always knew it was my mother. My father was terminally cool. But he had to know, and he did not protect us. After my father's death ~ and I mean immediately after he died, my mother told everyone that it was my father who made it impossible for our family to celebrate family. Man, she did some terrible, terrible things. I have a friend who lost her husband recently. I know another lady whose husband passed long before I met her. Both women honor their husbands memories, and miss them, most sincerely. So, I know how to do this, how to feel this correctly. I have been honored, to have had D H mom in my life to teach me how to love my babies, and to have had these women in my life to teach me how to honor myself, and my relationship to D H.
He has been through alot, with me. I mean, times when I did not know my mother was ~ times when I did not know that the way I had been brought up to see my mate was toxic. He stuck with me through it, though. She is poor now and to her only his money can save her since her quest to find love did not pan out. My sister found love on the internet. There he wa$. So that is why I don't understand now why she seems to need to exclude the other sibs with such single-minded intent. Maybe she believes that without us in the picture, my mom will love her. And maybe that is true. But then, why did my mom so absolutely risk my sister's displeasure by having the man come back, last summer? My sister (according to her last bless your heart I hate you phone call) plans to spend time with my mother in her house this summer. Or maybe I am just being biatchy. Or maybe, I have no role here, at all. And here is a secret. I don't think I really mean F you, mom. I think I mean boy, do I wish I had a mom. Maya Angelou. That is who I need for a mom. That is why I love Maya. She was on Oprah again, yesterday. I swear, she can heal us just with her words and her strength. but I would have been out of the house as much as possible too. I know. But my father was an adult. He had to know. He should have protected us. Here is a story: So, my mom had an affair a million years ago. Later in his life, my father created a successful ~ really successful ~ business. My mom told everyone in the office about the affair she had had a million years ago. Probably, she could not stand to see my father successful? Anyway, as part of all of it, my father finally left her, right? And do you know what she told me she told him? That if he left her now, he would never see his kids again. I was like, in my thirties when that happened. What kind of person makes those threats to a husband? We were adults. We could choose to see or not see our father. And why would she tell that to her thirty something daughter expecting it to be a triumph? Well. Sorry, SWOT. Back to your post. I still have that foggy feeling, like I must have missed something crucial around that whole event. My father went back to my mother. They lost the business. The partner pulled out and began his own business and all the employees went with him. Score one for my mother. She blamed that on my father's stubborness, on his insistence that the business be set up so either partner could do what the other partner did after my mother ~ made the workplace what it was, I guess. So, probably my mother really is dysfunctional. Not just with her children, I mean. They are full of baloney and share the same sandwich. But...I would like a bite. Lo contact yes, but not no contact. It is a form of abuse and obviously by the way my sister kept and maybe keeps reading my posts, it does not help the person who does it to let go of the person they allegedly have no contact with. There was obviously big interest in me from her, even after her no contact. I saw that with my sister, too. But I hate her for what she did when my daughter was so hurt. I hate her for stalking and encouraging my daughter to tell her every bad thing and then, dumping and never responding to my daughter, again. I hate that she made my daughter, who was so freaking vulnerable and struggling so hard to make sense of everything herself, cry. I do hate her for that. And then, once she had the dirt, she contacted me on FB as though she had just learned of it and asked me what happened. When I said (already healing a little, and no longer so willing to believe in FOO) "What is it you want to know?" she responded: "I already know." So, that was a really unbelievably nasty game. And like I always do, I just don't get the win. There has to be one. No one would do that on purpose. But in this instance? To a niece, to someone you knew as a little girl?!? Maybe I am seeing this wrong. And maybe, just this one time, I don't care. Forever. And yet, it was my daughter who convinced me to take my sister's calls, even after that. No one knows how to do this right. The exalt one and bash the other. I mean, I know why doesn't matter. Where was I going with this. But I did do that wrong thing and not do what I can so easily do to be there for my aging mother. D H says she made a choice every day when she did not keep contact once she was staying with my sister, and in being rude to my D H when he picked up the phone knowing it was my mom. She had called to tell us my sister was in the hospital. Not serious, given that my daughter had been in and out of Intensive Care, or had been fished out of snowbanks dead drunk after being beat to within an inch of her life and etc. I could definitely have used a mom or a sister during that time. D H and I had D H mom and family, though. And of course, I had all of you. It was still really so hard, though. But she is doing so well, now. So very, incredibly, impossibly well. We heard from both kids, and from all of our grands, yesterday. Four phone calls, for everyone to call...and they did that. They can eat my shorts. I never have the right words to say, or the intelligence to say it. You all speak very well, very real, and truthful. You all say what I think and feel and live for the most part. I know what I want, I think lol. I want to reach for it, but I say" job market stinks, ( ill take about anything to start with) there are other business established for what I would like to do, plus, it will take money and a masters! I still dont see how I can succeed in what I want because of my age, my past with family and exs, and because of my lack of intelligence and not being able to handle a conversation! I am scared, maybe the potential employers see this in me, just as family does. I refuse to give up and my best revenge ( im not revengeful, im not) is to get on my feet, learn all over again who I am and was, and be who I WANT to be, not who I HAVE to be!!!!! So yes, its a battle to fight for ourselves, who we are, we might not know who we are because we were trained to be what they wanted us to be. I do know Im not prejudice, I used to be a people person but no longer know who I can or should trust. Family still gets at me, mainly gpa, the rest left who does speak with me, just tells me just get on your own feet and do what you want when you can. So, I am lucky that my Aunt is now supporting me I feel, we both forgave each other of the past, and my fingers are crossed this a true aunt and niece relationship with her this time. Im sorry the therapist did that to you Scent and Somewhere, Im also sorry about your old teacher. I just dont understand why people do this. I asked in other threads, but, are these people just mean or do all these types of people have mental health issues? I mean, can there literally be two sides of humans, mentally healthy and all whos mean all mentally not? Or is it in threes, the thirds are just mean? I wish things were better for everyone, esp all of us and esp, our kids. But you know, when that happened? I was surprised that I could do that without intending to. If that is what happened, I mean. If that is what happened, to him. That is what that other therapist I saw later said, too. That counter-transference happens in an impersonal way, and that it has nothing to do with the person in therapy. That's perfect, SWOT. When we can find the original trauma, the original shaming event, then we can see it through our adult eyes. And we can see the wrongness in what happened, and the innocence of the child that we were. We have had to be so strong. I am sorry you were treated that way. I wish I had been there too, to witness for you. But we are doing well, here, witnessing for one another. And maybe, for those who are healing too, through our posts. I hope this is happening, for others. It is good to reclaim our legitimacy, and to honor ourselves and all we have been through. Copa, I will go to the Enabling thread when I have completed this one. Thank you for reading along too, Copa. because of my lack of intelligence and not being able to handle a conversation! I see no lack of intelligence in your posts, Confused. Hello! I am so glad you are here with us, too. Take very good care of yourself now, as you go through having a look at the things you were taught to believe about yourself. Toxicity washes through us, seemingly as strong as it was the first time those things they wanted us to believe about ourselves were sealed beneath that thin, unbreakable veneer of self-contempt. You are so worth it, Confused. Hold faith with yourself, and with us. I never have the right words to say, or the intelligence to say it. That is the second "intelligence" hit. That is the true thing you know that is trying to be healed. YOU were the intelligent one. So intelligent, in fact, that this is one of the places they determined to hurt you. My mother tells me to this day, implies it in a thousand ways, that I am not capable of thinking correctly. Interesting that the same woundings were the chosen woundings. What better way to break a little girl who trusted her parent to tell her true things? I know what I want, I think lol. I want to reach for it, but I say" job market stinks, ( ill take about anything to start with) there are other business established for what I would like to do, plus, it will take money and a masters! I still dont see how I can succeed in what I want because of my age, my past with family and exs, and because of my lack of intelligence and not being able to handle a conversation! I am scared, maybe the potential employers see this in me, just as family does. One small step at a time. Soon, you will be somewhere else, somewhere healthier. Then, you will be strong enough to take another small step. Sorry for the italics. The site will not slip me back to normal text. Check online for projects specifically designed to help parents intending to break into the job market after being home with their children. Call a local women's shelter. They will know. If they don't, do a generic online search. If that doesn't work, post here. We will help you find such a program. Remember those Rocky movies? That's you, Confused. And he won, and so will you. Against all odds because, just like Eckhart Tolle tells us, the pain body cannot stand before the fact of our presence. And that is what our abusers did to us. They hurt us into believing our presence was not good, was not strong. So, I am lucky that my Aunt is now supporting me I feel, we both forgave each other of the past, and my fingers are crossed this a true aunt and niece relationship with her this time. I am so happy for you both. We heal together. That is part of why our dysfunctional relatives try so hard to prevent that. I just dont understand why people do this. I asked in other threads, but, are these people just mean or do all these types of people have mental health issues? I mean, can there literally be two sides of humans, mentally healthy and all whos mean all mentally not? Or is it in threes, the thirds are just mean? I wish things were better for everyone, esp all of us and esp, our kids. What I do know is that we don't have to believe them. Once we see them, once we see those bad, hurtful patterns and realize they are doing this to everyone in their lives...then we can choose to be free. It's like we are under a spell. Don't believe them. Even if you do believe them, know that place inside has come back to you now, so visible and hurtful, to be healed. And it is coming back now because now, you are strong enough. Nothing can stand, before the simple fact of our presence. That was Eckhart, of course. The other thing. About job interviews. This is a practice, Confused. When you are ready, you will be offered the job that is already out there, waiting for you. In the interim, with every interview, you are learning how to do this thing. Absolutely. You can do this. I have every faith in you. For now, until you are stronger enough to hold strong for yourself, that we believe in you will be enough. One day, when you are healed too, you will help others. We can only clarify issues for others that we have come through, ourselves. You are lost in a primitive forest. It is night. You are determined, but you don't know where you are going. All you know is that you have decided to move. Huge, twisted trees, so ancient, all around you. You cannot see how to go. Then, far, so far in the distance, you see the dim glow of light. That is us. We are on the other side of the forest. We know you are coming. We are holding the light.